The biggest news this week was that I am moving back to run a game team. I enjoyed the month I worked with Brian Graham and the other members of the Project Management Office (PMO), but my passion lies with game teams. Sorry, Brian and I will continue to support the goals of the PMO while I work on my new game. On the new team, I will be the Program Manager, which means I will be responsible for the development of the game. The title has not been announced and the planning is at its very infancy. So, I cannot say the exact title I’m working on yet, but once it is announced, I will let everyone know. All week long I was in leadership training called LeaderPoint. It was a very good course and I enjoyed it. The first three days were a business simulation where we could “do anything except sell stock”. In fact, some of the people broke away from their companies and started their own company. The whole simulation was an attempt to let you “fail in a safe environment” and teach you through doing. While I thought the simulation was interesting, I thought our instructor, Mike Laddin, and his lectures to be the most engaging. Some of it was things I already knew, but it was a different spin on some other management styles I’ve heard of. It’s also really nice to have someone come in and talk where you can ask questions about situations that have happened to you. In the end, I can’t recommend it more and if you are in charge of setting up training for your business, you should check out their courses. Another month has gone by and it’s been quite a trek for the French family. The biggest event being the pack-up of the house and driving from Houston to Florida. On July 4th weekend, I flew from Orlando to Houston one way and then the next morning started the drive back to Florida. This time in the Sequoia and with the camper in tow. It was a boring drive, but went quick and before you knew it, we were pulling up to our new house which I had closed on the week before. We were also in luck, the driver had called and said that he was going to be able to drop off all our stuff on Sunday, July 5th. This was great, because I would be home in order to help. The next few weekends have been one of just settling into our new house. It had no lights in any of the rooms, so we installed six ceiling fans and then Jennifer’s dad sold us some mini-blinds, which we installed. Over the past three weeks the garbage guys loved us as we left a mountain of boxes at the curb each Friday morning for them. Last weekend we had a big push to get everything done. Last Sunday we were literally going from 9:30 a.m. to 9:30 p.m. that night. But it paid off, because we were able to just rest this weekend, which was my birthday weekend. We weren’t able to rest that much on Friday went I got a panicked phone call that morning. Jennifer had taken the girls to McDonalds to play around. 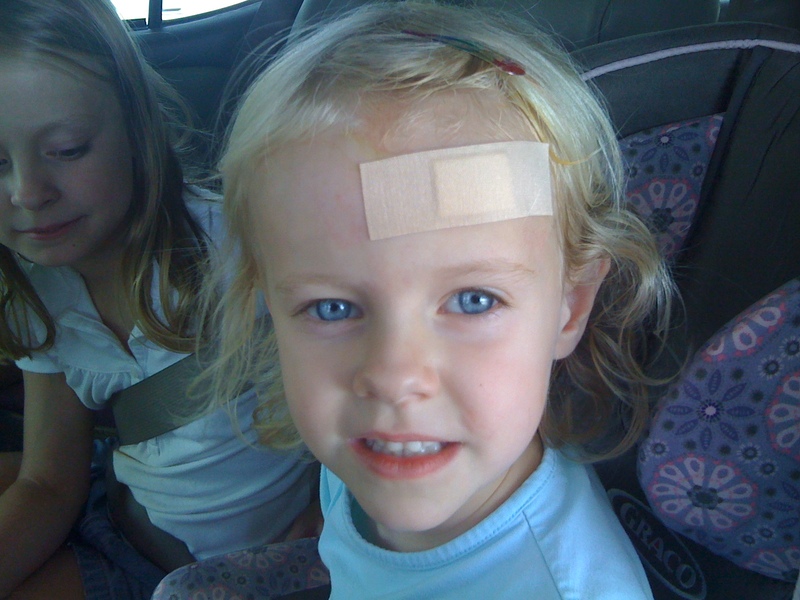 Izzy had hit her head on the gym equipment and cut it open. Several of the moms there helped Jennifer stop the bleeding and then she was off to the hospital. I met them at the ER where Izzy had to get three stitches. She was in a lot of pain, but got through it and she’s doing fine. Not wanting a big birthday celebration, I just wanted to go out to eat where I went a couple of years ago. So, we headed out to Jimmy Buffett’s Margaritaville to have a margarita and a Cheeseburger in Paradise. We went there, but forgot to make a reservation, so we were waiting for over an hour for a table. The margarita was good, but the restaurant was burning up hot. We didn’t wait for desert. 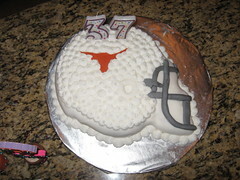 We booked it out of there and headed home where Jennifer had baked a Texas Longhorns helmet cake, which we devoured once we got home.